While Scrum is becoming increasingly popular as a project method for software teams or Internet agencies and the like, it is also being used more and more often in other areas such as sales, marketing and finance. Scrum offers a solution to the frequent problem of budgets that overrun or are seriously over-budget. In short, Scrum involves project teams carrying out short ‘sprints’ during which they focus on creating a top-quality working product. The whiteboard has an important role during a Scrum project, along with the Magic Chart Notes (see picture), whiteboard markers, erasers and board cleaners. A whiteboard visualizes the entire process during a Scrum project. With a well-organized Scrum board, you can see the workload and progress of a project at a glance with total ease. Colored Magic-Chart Notes can be used in different columns to keep track of work already completed, work in progress and work still to be carried out. Of course, a Scrum board may look different from one organization to the next and every method used will be unique in its own way. Many Scrum teams manage to transform a regular whiteboard into a workable Scrum board. Some teams mark out boxes with black tape while other teams prefer to use a preprinted whiteboard which you can write on using a marker. 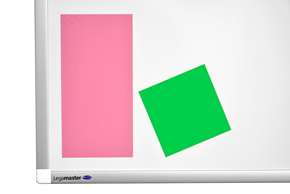 Legamaster offers a flexible product solution for both situations, as well as corresponding accessories, naturally. Want to find out more about Scrum using Legamaster products? Discover our wide range under ‘Products’ and find the products that you've been looking for. Got a question or need specific advice? Please contact us. We will be happy to help you choose the Scrum products that are right for you!